Your business card is one tool that helps in the networking process. Used appropriately, it continues to speak for you after you've met someone and encourages follow-up and further conversation. Your card can be an extension of you. It not only goes where you go, but lingers when you give it away so someone may find you again. When it is eye-catching, it represents an accurate picture of you and your company, and contains the necessary information to stay in touch with you. The only thing left that guarantees it will be put to good use is the method in which it was received. Take the time to meet people. Connect through conversation first. Find out if people are interested in your product, service, or skills. If they are, and they want to discuss more about what you do, they will ask for your card. Recently, a creative arts industry business owner pointed out to me that he sometimes begins a conversation by sharing his unique business card as a part of his "hello." He mentioned that presenting his card serves to "break the ice" at events where he doesn't know anyone. Some networking events are set up with the expectation of exchanging cards. If someone asks for your card, don't forget to ask for a card in return. You will want to have it for your own follow-up. When someone gives you a business card, it's important to remember how you feel when you give yours and it is received. When you accept a card, thank the person for it, and take a look at it. Notice the person's name and any other information that stands out. Then comment on it. "You introduced yourself as Jimmy, but your card has James on it. It's okay if I call you Jimmy, right?" or "Your office is in Burbank? So is mine. Let's meet up for coffee sometime." 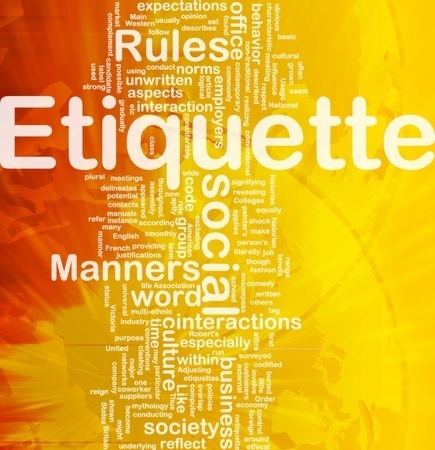 This method ensures that your new acquaintance feels important and that further conversation is possible. It also gives a much more positive impression than taking the card and immediately shoving it in your pocket or handbag without even glancing at it. The business card is helpful for exiting a conversation at a professional event so that you have time to meet other people. Do this by asking the interesting person with whom you're speaking for her/his business card, along with, "I've enjoyed meeting you and I'd like to learn more." Then, do follow up. Have a designated place for your own cards, and a place for the cards you receive from others. (Left/right jacket pockets, or two ready-access places within your small handbag.) This is helpful in two ways: You won’t be exchanging someone else’s card as your own. Also, there is nothing that spoils a first impression like having to rummage through your bag or clothing to find your card, seeming unprepared or disorganized. You may have notes to add on the other person’s card later, but do not write on the person’s card in front of her. Avoid asking for a card if you don’t intend to contact the person. However, you may be handed a card that you didn’t ask for, in which case you do not need to “reply” to the person who gave you the card. Given the hierarchical nature of the culture, others will look to see your advancements. Be sure to designated degrees and titles. The language of business is English, so one-sided cards are fine. Only the right hand is used to give and receive a card. Business card protocol is hierarchical, ceremonial, and is an integral part of introductions. While slightly bowing, the card, facing the receiver, is held in the corner, so as not to obstruct the name or logo. Business cards are received in both hands. Cards are studied and commented upon and are placed either in a holder or jacket, but never anywhere below the waist. 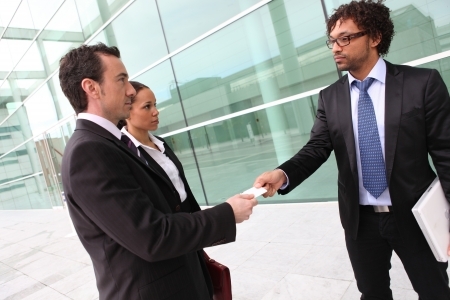 Both hands are used when presenting cards and receiving cards, and while facing the person who is receiving the business card. Do not immediately put the card in a pocket or bag as it is considered very rude. Business cards are considered as an extension of the person. Giving business cards in English is acceptable. Include your title and position as status and rank are valued. Have your business cards printed in both English and Portuguese. Distribute the cards to everyone present at the meeting when you arrive, making sure that the Portuguese text is facing up. Business cards are never given out in bulk or passed around at meetings. When you give a business card in Germany, you are giving the recipient permission to contact him/her in the future. Cards you collect should be treated as confidential and private. Exchange business cards (one side translated into Russian using Cyrillic text) after the initial introductions without formal ritual. Be sure to include advanced university degrees on your card. Exchanging business cards is not a common practice. But if you choose to give your card to others at a meeting, it is best to wait until the end of the meeting. Sharing business cards isn’t as common as it is elsewhere. You can present a card at the introduction, but keep the content of the card to facts and figures. The most important point of business card etiquette is showing respect. Wherever you are, and whatever business you are in, respect for others who are striving for the same end result will only make you more memorable - and could even escalate your business.